On this day in 1876 one of the greatest failures in risk management took place when Lieutenant Colonel George Armstrong Custer and his entire 7th Cavalry were wiped out at the Battle of the Little Big Horn. Custer had split his command into three wings and he took his battalion of 200 or so men down the center of what he thought would be little resistance. Instead he found that he was facing a far superior force of 3000 largely Sioux warriors who quickly overwhelmed and defeated Custer’s command, with all US troops being killed. There is now some debate on whether all the cavalrymen were actually killed by the Native Americans or took their own lives, saving the last bullet for themselves, in western parlance. Historians have debated over time the reason for Custer’s defeat. 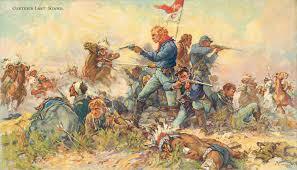 Was it arrogance; bad intelligence; faulty command, just plain stupidity or even a wish for martyrdom by Custer? Whichever the cause, it was the worse defeat of the US Army by Native Americans in the Western campaigns of the later 1800s. Today, it might be termed as a faulty assessment and management of the risks involved. I thought about Custer and his defeat when I read a recent article in the Harvard Business Review (HBR), entitled “Strategy How to Live With Risks”. It presented risk, risk assessments and risk management in a new light, a key acumen being that risk management should be used as a “protection shield, not an action stopper.” It was based upon a research paper by the CEB, entitled “Reducing Risk Management’s Organizational Drag”, which I thought it had some interesting insights for the Chief Compliance Officer (CCO) or compliance practitioner. This retrospective look back is coupled with what the author says is a decision making process which “is too slow, in part because of an excessive focus on preventing risk” and not managing risk; in other words, companies were slowed down even further by something termed “organizational drag”. Companies need to find new mechanisms to assess and manage risk going forward. The best way to do so, many companies have indicated, is through reorganizing or reprioritizing risk management and the article presented “three best practices” in doing so. Recognizing that risk management is often simply ‘just saying no’, the HBR articcle suggests that “Today’s risk managers see their role as helping firms determine and clarify their appetite for risk and communicate it across the company to guide decision making. In some cases this means helping line managers reduce their risk aversion.” The interesting insight I found here is that if an asset is low performing it may be because the management is so risk averse. This may present a CCO or compliance practitioner with an opportunity to increase growth through other risk management solutions that they could implement. The article ends by noting that the goal is “to transform risk management from a peripheral function to one with a voice integrated into the day-to-day management” of an organization. That is also viewed as a component of CCO 2.0 and a more mature model of improvement. By focusing on training employees on how to spot Foreign Corrupt Practices Act (FCPA) compliance risks and then providing them with the tools to adequately manage that risk, CCOs can deliver greater value.